Patrick Saunders (Kernow Ecology) conducted a field survey commissioned by BBCT’s West Country Buzz Project in summer 2018. This was to assess the current status and conservation requirements of Brown-banded Carder bee and Moss Carder bee in North Devon, in partnership with other West Country Buzz project surveys. 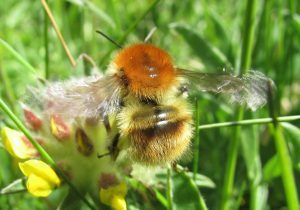 The Brown-banded Carder bee and Moss Carder bee are listed as Biodiversity Action Plan species (S.41). The Brown-banded Carder bee is also a Devon priority species in the Devon Special Species list. In the 1950’s-1980 there were widespread Brown-banded Carder bee records in South Devon, Dartmoor and the North Devon coast. The Moss Carder bee was also recorded in these areas but less frequently. The survey found Brown-banded Carder bee and Moss Carder bee to be still present in North Devon. But the population is now extremely weak and greatly reduced. Only one Brown-banded Carder bee was found in Hartland Point area. 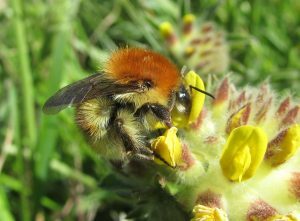 Other 2018 West Country Buzz surveys found a small number of Brown-banded Carder bees and Moss Carder bees in the general area of Braunton Burrows. Both bumblebees have probably gone from other areas in Devon. Declines of both species have almost certainly paralleled the loss of unimproved grassland and traditional hay meadows in Devon. Devon has had a post-war change from more mixed farming to intensive grass cut for silage. The Brown-banded Carder bee typically occurs on flower rich coastal sites in Devon and Cornwall. The Moss Carder bee can be also found on the same sites, although it is much rarer and associated with cooler and wetter habitats. The Brown-banded Carder bee is a ‘doorstep forager’ requiring a large quantity of high quality pollen and nectar resources, continuously available between May to September within short range of the nest site (probably less than 1km). Coastal areas are the most likely sites to have this diverse and very high quality resource availability. Both species are strongly associated with abundant Kidney vetch (Anthyllis vulneraria), which is likely to be a key requirement for colony establishment in Devon and Cornwall. 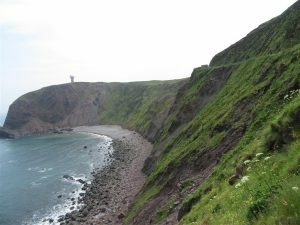 The survey work established areas to prioritise conservation effort: one on the Hartland Point coast another between Westward Ho! and Ifracombe. There should be optimism that Brown-banded Carder and Moss Carder bees can be conserved in North Devon. 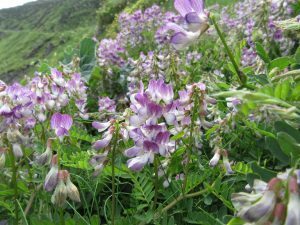 Many of the best areas have fairly large areas of flower rich habitats remaining, although both under-grazing and over-grazing is still a problem. Outside the coastal fringe grassland is very flower poor. Brown-banded Carder bee champions are needed to work to tweak site management plans, ensure existing agri-environment schemes commitments are fulfilled and to inform land-managers. The West Country Buzz Project is clearly needed by the Brown-banded Carder bee and Moss Carder bee.